The fastest time in a swimming match can only be achieved by a perfect combination of strength and technique. How do you measure these factors and how do you translate that data into the ideal training? A team of researchers, top athletes and companies presented their solution: a smart sensor that measures the swimmer’s movements and gives real-time insight into the swimming performance. 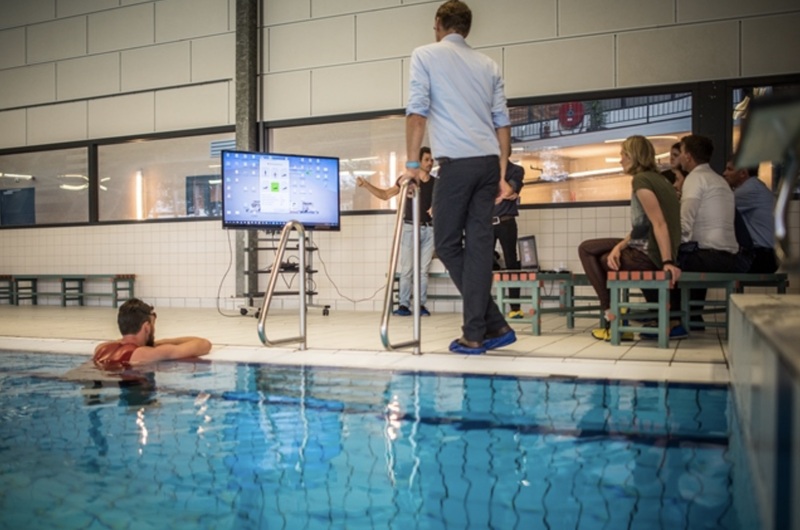 During the final meeting of the research project today at the Institute for Sport Studies in Groningen, former Olympic swimmer Sebastiaan Verschuren demonstrated the sensor. “The small device integrated into his swimsuit measures, among other things, the speed, movements and heart rate of the swimmer,” explains project leader Martin Truijens. Through linked software, the coach immediately sees the measured data of the swimmer, which can be used to tighten training. 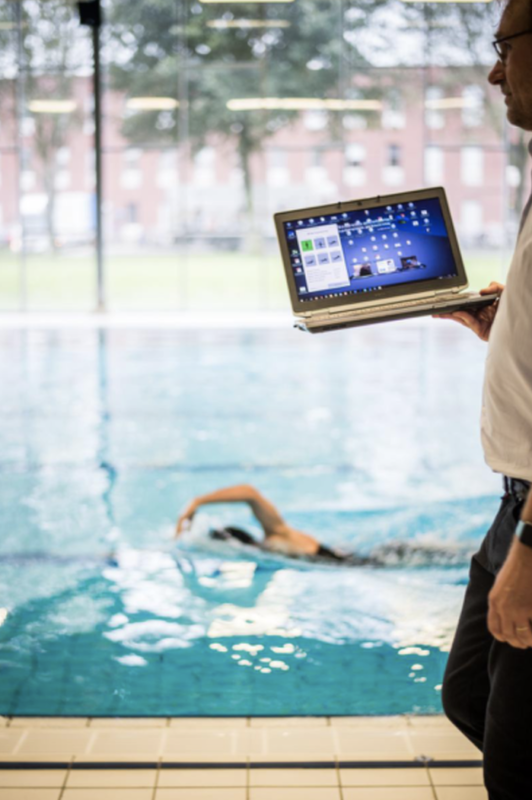 Although the robustness of the system needs to be further optimized, the sensor means a breakthrough for swimming, especially in comparison to the stopwatches previously used before. It makes it possible to measure the performance of a swimmer safer. Not only the type of stroke and the number of strokes per track are measured, but also the heart rate and time between sales and turning points or finishes are recorded. Small irregularities in the swimming movements, which were previously unknown, are now exposed. For four years, Martin Truijens, who in the past was a coach for the Dutch swimming team and among others Femke Heemskerk trainde, worked with the researcher and embedded scientist of KNZB Sander Ganzevles. Two companies were very important: Lode and 2M Engineering. “They specialize in ergometer and sensor technology and have sheltered work,” says Truijens. “Developing the sensor has been a puzzle,” he says, “because the existing technology underwater is not working well. You get noise or crawling water between the meter and the body of the athlete. We have to solve that in clever ways. “In addition, the user-friendliness of top athletes had to be taken into account. But this sensor is not an obstacle during training, Sebastiaan Verschuren confirms. executed on behalf of the Ministry of VWS and NOC * NSF and jointly developed, co-financed and executed by NWO domain TTW, NWO domain SGW and ZonMw, in collaboration with the Stichting Innovatie Alliantie (SIA). This project is part of the ‘Performance’ pillar, in which science is linked to top sport. In this project, Vrije Universiteit Amsterdam and Eindhoven University of Technology worked together with Lode bv and 2M Engineering and the KNZB.